In the summer of 2012 Sound Systems UK re-engineered the sound system installation at the church of St. Bartholomew in St. Albans by supplying and installing a steerable array loudspeaker. 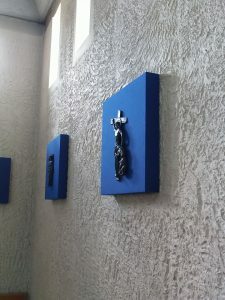 In the summer of 2014 when the church had the opportunity to purchase and install new ‘stations of the cross’ it was decided to enhance the acoustics of the interior in respect of speech intelligibility whilst at the same time striving for a pleasing aesthetic with the addition of acoustic panels on to which the fourteen cast figures could be mounted. This idea, which was devised by the clergy of St. Bartholomew’s was then engineered into reality and installed by Sound Systems UK. From an acoustic perspective, the idea could hardly be more suitable as the required location of the ‘Stations’ is directly adjacent to and above the listeners who would otherwise be disadvantaged by potentially damaging acoustic reflectionsfrom the nearby side wall. “St Bartholomew’s church interior design is harsh and for many years the Parish struggled with an acoustic which made hearing and understanding anything extremely trying. The new system installed in 2012 to coincide with the Golden Jubilee of the Parish and the visit of Archbishop (now Cardinal) Vincent Nichols solved 50 years of acoustic problems overnight. We were aware that a little more could be done and the installation of new Stations of the Cross provided the ideal opportunity. We wanted these mounted on some panels to enhance their position on the walls and asked Sound Systems UK if these could be mounted on acoustic panels, which, we felt, would just soften and enhance the overall acoustic experience of the congregation. Once the panels had been ordered, they and the Stations were fixed and mounted in a day. This has been an enormous success, both liturgically and acoustically and we are very grateful to Peter Kenny and Sound Systems UK for undertaking this work in such a sensitive, encouraging and professional manner”.